The RICE family came to Clark Co., Ohio in 1809 from Vermont, although the previous generation was from Mass. The oldest known is Edward RICE b. about 1782. He married Lucy POOLE, the daughter of William POOLE and Lois MOORE. 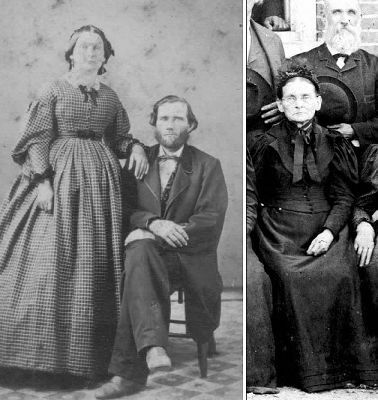 Edward and Lucy had 11 children, all but the eldest, Polly, were born in Clark Co. Their 7th child, Alonzo RICE married Mary Ellen ALT, daughter of Adam and Maria DREW ALT, also early pioneers of Clark Co. OH. Alonzo and Mary had 5 children. Their daughter Mary Belle RICE married Wesley MCDONALD in Springfield on Dec 20, 1877. They were the parents of Flora Belle MCDONALD b. in 1889. She was my grandmother. She married Arthur Lester FOLEY, son of Charles W. and Anna TOLAND FOLEY, on Dec 12, 1911 in Springfield. They were the parents of my mother, Barbara Lou FOLEY who married Jack Allen Martin in Springfield on June 9, 1945. I Edward RICE of the county of Clark and State of Ohio, do make and publish this my last will and testament. Item 1st It is my will that my funeral expences and ll my last debts be paid out of the proceeds of my personal property. Item 2d I give and Devise to my beloved wife in lieu of her dower my mansion house with the lot on which said house is situated, and now enclosed with a board fence, including the garden lot inclosure with a poling(? ), and so much of the barn as may be necessary to store away her part of the grain which may be raised on the farm, so long as she may remain my widow. I also give and devise to her in addition to the above al my personall property of every kind and character together with all monies at interest with the exception of so much as may be necessary to discharge and pay any legacy herein after mentioned. Also the one third of the proceeds of the farm which is here after devised to my sons Harrison RICE & William RICE, untill the said William shall arrive to the age of twenty one years. Also one third of the proceeds of the BABB farm herein after devised to my sons Alonzo RICE & Henry C. RICE untill the said Henry C. shall arrive to the age of twenty one years, for the use of the my said wife & the education & maintainance of my minor children. Item 3d I devise & bequeath to my three daughters, Polly CHAMBERLIN, Melinda SPRAGUE & Sally SPRAGUE and their heirs & assigns forever the tract of Land which I purchased of Isaac WARD, lying in the N.W. Quarter of S4, T4 & Range 9 (for a more particular description see the deed from said WARD), to be equally divided among them or the proceeds of the sale thereof as they may choose. Item 4th I devise & bequeath to the legal children and legal heirs of my son Asahel RICE the 20 acre trat of land lying in Harmony Township, being a part of S. 35. T6. & R9,MBS which I now own with all the improvements thereon, which said premises my said son Asahel RICE shall have the right to occupy and have all the rents, pices & profits thereof during his natural life time upon the condition that the said Asahel RICE shall pay to my executors the sum of four hundred dollars, to be paid in the following manner, to wit. one hundred dollars to be paid one year after my decease, one hundred in two years, one hundred in three years & one hundred in four years, and of the said Asahel RICE shall fail to pay the said four hundred dollars as above mentioned at the times above mentioned, my Executors are authorized hereby to see by private sale or otherwise so much of said twenty acres as shall be sufficient to bring the said sum to be taken of the south side of said Twenty acre Tract. Item 5th I devise & bequeath to my two sons Harrison RICE & William RICE the farm on which I now live, Bounded as follows, to wit. Beginning at a point in the road leading from Springfield to Clifton at the North East corner of what is called the DUNHAM tract. Running thence with said line East to Joseph WHELDON's land, thence with his west line North to the place of beginning containing sixty acres more or less, to be divided equally between the said Harrison & William by a line running North & south entirely through said Tract. The East half to belong to the said Harrison RICE, his heirs & assigns forever and the West half to belong to the said William RICE, his heirs & assigns forever. Item 6th I devise & bequeath to my two sons Alonzo RICE & Henry C. RICE the farm which I purchased from John BABB except about sixteen acres which I have above devised to my sons Harrison & William. Also fourteen acres or thereabouts which I purchased of the Administrators of REEDER lying in the west of the tract of land above devised to my sons Harrison & William, which tracts of Land are to be equally divided between the said Alonzo & Henry C. by lines , Running North and south entirely through each of said tracts, the said Alonzo is to have & to hold the East halves of said tracts to him & his heris & assigns forever, & the Said Henry C. is to have & to hold the West halves of said tracts to him & to his heirs & assigns forever. Item 7th I devise & bequeath to my daughter Celoma RICE five hundred dollars to be paid by my executors when she shall arrive at the age of eighteen years. Item 8th I devise & bequeath to my grand son Edward CHAMBERLIN, son of Lanson (Lansing) & Polly CHAMBERLIN, the sum of one hundred dollars which sum of one hundred dollars shall be put out at interest by my executors untill the said Edward CHAMBERLIN shall become or arrive to the age of twenty one years & the interest thereof shall go towards educating him, and when he arrives at the age of twenty one years the said sum of one hundred dollars shall by my executors to be paid over to this said Edward CHAMBERLIN. Item 9th I do hereby nominate and appoint my beloved wife, Darius B. SPRAGUE & Horace POOL executors of this my last will & testament. I do hereby revoke all former wills by me made. Springfield, Ohio. 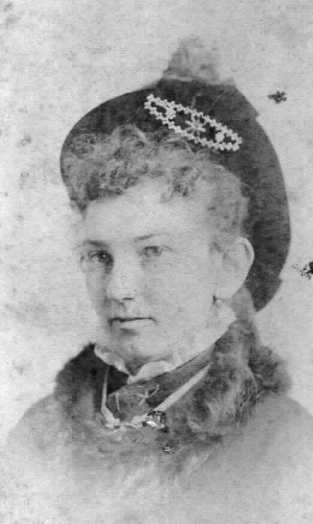 Mary Belle RICE, daughter of Alonzo and Mary ALT RICE was born 27 Feb 1856. She married Wesley MCDONALD, son of Robert McDonald of Batavia, Genessee Co, NY. They had 3 children. Their daughter Flora Belle MCDONALD married Arthur Lester FOLEY Dec 12, 1911 in Springfield. They were the parents of my mother, Barbara Lou FOLEY. Flo's mother, Belle RICE MCDONALD, pictured above, was a milliner and a seamstress of some note. Flo always appears to be a well-dressed young woman in her earlier pictures. This photo of Flo, below, was probably taken about 1911 as her engagement picture. HARRISON RICE, retired farmer; P. O. Springfield. The father of this gentleman was Edward Rice, a native of Massachusetts, who was there married to Lucy Pool, daughter of William and Lois Pool, natives of that State, the family moving to Vermont with Mr. Rice shortly after his marriage. In 1809, they concluded to come to Ohio, and, upon reaching the head of navigation on the Allegheny River, they built a pine log raft, upon which they descended the Allegheny to the Ohio, thence down the Ohio to Cincinnati, where they remained until 1812, when they came in wagons to Clark County, settling in the western part of Harmony Township, south of the present village of Harmony. Here Harrison was born, Oct. 8, 1823, being the sixth in a family of ten children, as follows: Polly, the widow of Alansan Chamberlain, of Indiana; Asa, deceased; Malinda, the deceased wife of L. B. Sprague; Sarah, wife of Darius Sprague; Eliza (deceased), Harrison, Alonzo, Celoma (wife of Robert B. Minnich, of Piqua), Henry C. and William. In 1838, Edward Rice sold his farm in Harmony Township and purchased property south of Springfield, upon which a portion of the city now stands, most of it yet belonging to his heirs. He died Jan. 10, 1843, his wife surviving him many years, dying Oct. 22, 1877. The subject of this sketch received a common-school education, and, Aug. 24, 1846, he was married to Amelia Goudy, daughter of Andrew and Elizabeth (McBeth) Goudy, pioneers of Green Township, who afterward settled on Sec. 19, on the southern . line of Springfield Township, where Mrs. Rice was born Aug. 21, 1826. Seven children have been born of this union, as follows: Althia M., the wife of George M. Whitcomb; Elizabeth, the wife of Mathew Stewart; Myra, who graduated at the Springfield High School in June, 1878; Edward, a graduate of Van Sickle's Business College of Springfield, receiving his diploma in April, 1872; and Forrest, who will graduate this year from the high school. Mr. Rice came with his parents, in 1838, to the property where he now resides, and farmed the land upon which the southeastern portion of the city is built. Politically, a Republican; a man of honest principles and unswerving integrity, quiet and unassuming in his manners, he well deserves a place in the pages of this book. ALONZO RICE, farmer; P. O. Springfield. He was born in Harmony Township, this county, July 8, 1825; is a brother of Henry C., and lives on an adjoining 25 acres to Henry; their land is a part of the farm purchased by their father. When Alonzo was 17 years old, he served two years as an apprentice at the blacksmith's trade in Springfield, and then two years as journeyman, when he took a half-interest in a shop, and, at the end of one year. started a shop for himself, which he carried on some two years; he then removed to New Moorefield, this county, where he lived three years, working at his trade, when he returned to Springfield, and, after working at his trade for a short time, he concluded to quit blacksmithing, which he did, and since then has been a farmer. He was married., June 22, 1847, to Mary E. Alt, sister of George and Daniel Alt; they have five children, all living - Adam L., who was married, Oct. 20,18 70. to Florence E. Monahan; Lucy J., who was married, Nov. 10, 1870, to Caleb Bird; Maria E., who was married, Sept. 25, 1872, to Charles M. Toland; Mary Belle, who was married, Dec. 20, 1877, to Wesley McDonald; and Charles A. The four who are married live in sight of their parents, and Charles is still at home. Mr. Rice was a member of the Sons of Temperance for several years, and is a strong advocate on the side of temperance. Politically, he casts his vote with the Republican party, and among his fellow-men is regarded as an honorable, upright citizen. HENRY CLAY RICE, farmer; P. O. Springfield. Mr. Rice lives just beyond the city limits on the south, where he owns 25 acres of beautiful land, which he has laid off into lots; said plat contains ninety-five very desirable building sites, and is called by its founder Riceville; it contains three streets, viz., Henry, Clay and Rice. Mr. Rice was born in Harmony Township, Clark Co., Ohio Sept. 25, 1830; he is a son of Edward and Lucy Rice. When 14 years of age, he began the trade of saddle and harness making, at which he worked some three years, but, on account of poor health, was obliged to seek different employment; hence he learned the carpenter's trade, at which he worked six years, and since then has devoted his time chiefly to farming. He was married, Aug. 12, 1855, to Sarah S. Dean; their children are Ida Belle, Edward A. and Harry C.; Ida was married, Nov. 27, 1879, to Willis Little; Edward was married, Nov. 24, 1880, to Alice Pool. Mr. Rice is a man of good moral character, honorable and upright in all his dealings, and possessed with a warm, genial spirit, which prompts him to many acts of kindness; although a sober, industrious man, yet he loves a day of recreation, and still keeps up the practice of taking a deer and wild turkey hunt once a year. WILLIAM RICE, farmer; P. O. Springfield. Mr. Rice lives on a beautiful farm three and a half miles southeast of the city. of Springfield; his fine house, good barn and other modern improvements are indications of a tidy and thriving farmer; he engages quite extensively in raising fine hogs of the Poland China breed. He was born in this county Feb. 17, 1833, and is the son of Edward and Lucy (Pool) Rice; his parents were natives of Vermont and came to this county in an early day. William was married, Jan. 3, 1856, to Matilda Goudy, daughter of Andrew and Elizabeth (McBeth) Goudy; her parents were also early settlers of this county, coming here in 1826, and settled on the farm now owned by Mr. Rice; they have six children, viz., Lillie M., Laura O., William E., Harry A., Claud F. and Zella B. Mr. Rice has followed farming all his life, preferring it to any other trade; he began working for himself at the age of 10 years, with no fortune but his good name, and, by perseverance and good management, has accumulated quite a fortune. Mr. and Mrs. Rice stand high in the estimation of their neighbors, and enjoy their home and family. *1. EDWARD1 RICE1 was born 1782 in Vermont2, and died 10 Jan 1843 in Clark County, OH3,4. He married LUCY POOLE5,6,7 Abt. 1809, daughter of WILLIAM POOLE and LOIS MOORE. 2. i. POLLY2 RICE, b. 1809, NY; d. 1892, Logan Co, OH. 3. ii. ASAHEL RICE, b. Abt. 1812, OH; d. Bef. 1860. 4. iii. MELINDA RICE, b. 30 Oct 1814, OH; d. 28 Aug 1872. 5. iv. SARAH RICE, b. 27 Sep 1816, OH; d. 25 Dec 1890, Clark Co, OH. v. ELIZA RICE, b. 18 Aug 1821; d. 03 Sep 1831. 6. vi. 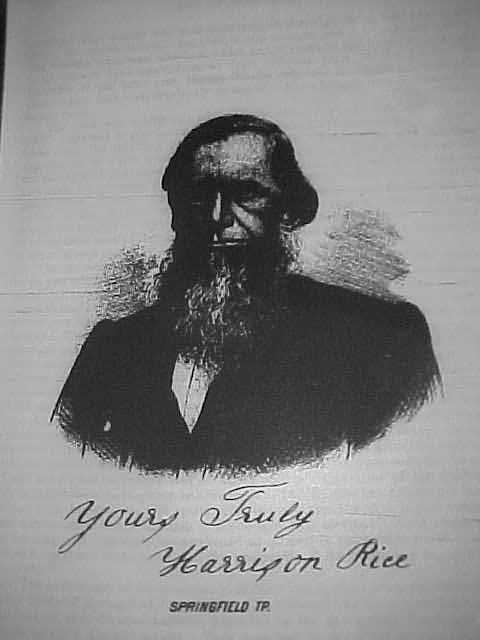 HARRISON RICE, b. 08 Oct 1823, Springfield Twp., Clark Co., OH; d. Bet. 1893 - 1900, Clark Co., OH. *7. vii. ALONZO RICE, b. 08 Jul 1825, Harmony Twp., ClarkCo., OH; d. 01 Jun 1904, Springfield, Clark Co., OH. 8. viii. CELOMA RICE, b. Abt. 1828, OH; d. Abt. 23 Jul 1912. 9. ix. 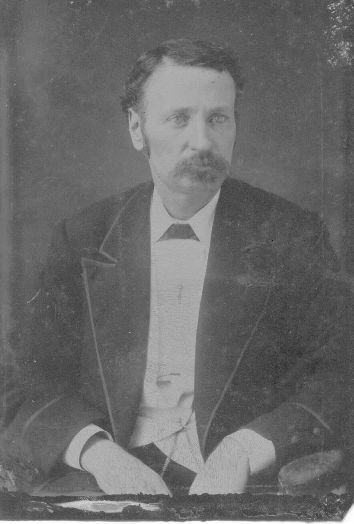 HENRY CLAY RICE, b. 25 Sep 1830, Harmony Twp., Clark Co., OH; d. Aft. 1885. 10. x. WILLIAM RICE, b. 17 Feb 1834, Clark Co., OH; d. Apr 1907, Clark Co., OH. xi. JAMES EDWARD RICE, b. 26 Jan 1839, Clark Co, OH; d. 31 Jul 1839. 2. POLLY2 RICE (EDWARD1) was born 1809 in NY, and died 1892 in Logan Co, OH. She married LANSING CHAMBERLIN 27 Nov 1827 in Clark Co, OH8, son of JUDAH CHAMBERLAIN and PHEBE MEAD. 11. i. EDWARD R.3 CHAMBERLIN, b. 1839, OH; d. 1873.
ii. JONATHAN C. CHAMBERLIN, b. Abt. 1841.
iii. PARTHENA CHAMBERLIN, b. Abt. 1844. 12. iv. ALONZO CHAMBERLIN, b. Sep 1843, OH; d. 21 Apr 1917, Logan Co, OH. v. MICHAEL CHAMBERLIN, b. Abt. 1848. 3. ASAHEL2 RICE (EDWARD1)9 was born Abt. 1812 in OH10, and died Bef. 186011,12. He married ORRISSA SPRAGUE13 07 Sep 1836 in Clark Co, OH14, daughter of JAMES SPRAGUE and POLLY UNKNOWN. i. JESSICA3 RICE15, b. Abt. 1837.
ii. MARY RICE16, b. Abt. 1840. 13. iii. JAMES S. RICE, b. Aug 1843, OH; d. 10 Aug 1922, Springfield, Clark Co, OH. iv. LEONARD M. RICE17, b. Abt. 1853; m. EMMA YEAZELL18, 13 Sep 1874, Clark Co, OH19. 4. MELINDA2 RICE (EDWARD1) was born 30 Oct 1814 in OH20, and died 28 Aug 187221. She married LEONARD B. SPRAGUE22 22 Jan 1835 in Clark Co, OH23, son of JAMES SPRAGUE and POLLY UNKNOWN. 14. i. LUCY3 SPRAGUE, b. Abt. 1836, OH. 15. ii. POLLY ANN SPRAGUE, b. Abt. 1838, OH. iii. BISHOP SPRAGUE24, b. Abt. 1842. 16. iv. AMANDA MELVINIA SPRAGUE, b. 07 Nov 1843, Clark Co, OH; d. 11 Feb 1921, Dayton, OH. 17. v. NATHANIEL B. SPRAGUE, b. Abt. 1846, Harmony, Clark Co., OH. vi. ORRISSA SPRAGUE25, b. Abt. 1849.
vii. MARY SPRAGUE26, b. Abt. 1852. 18. viii. FLORETTA S. SPRAGUE, b. 1854, OH. 19. ix. ADALINE SPRAGUE, b. Nov 1848, Harmony, Clark Co., OH. 5. SARAH2 RICE (EDWARD1) was born 27 Sep 1816 in OH27, and died 25 Dec 1890 in Clark Co, OH28. She married DARIUS SPRAGUE 08 Jan 1837 in Clark Co, OH29, son of JAMES SPRAGUE and POLLY UNKNOWN. 20. i. PARTHENA3 SPRAGUE, b. 12 Nov 1838, Clark Co, OH. 21. ii. LUCINDA SPRAGUE, b. 12 Dec 1840, Clark Co, OH; d. 12 Nov 1907, Ashtabula, OH. 22. iii. JAMES E. SPRAGUE, b. 15 Mar 1844, Harmony, Clark Co., OH; d. 31 Dec 1933.
iv. SARAH SPRAGUE, b. Abt. 1846; m. CORWIN PRICE. 23. v. DARIUS A. SPRAGUE, JR., b. Abt. 1848, Clark Co, OH. 24. vi. WILLIAM S. SPRAGUE, b. Abt. 1853. 6. HARRISON2 RICE (EDWARD1)30,31 was born 08 Oct 1823 in Springfield Twp., Clark Co., OH, and died Bet. 1893 - 1900 in Clark Co., OH. He married AMELIA GOUDY32 24 Aug 1846 in Clark Co, OH33, daughter of ANDREW GOUDY and ELIZABETH MCBETH. i. ALETHA MATILDA3 RICE34, b. 10 Sep 1847, Springfield, Clark Co., OH; d. 17 Jul 1888; m. GEORGE N. WHITCOMB, 15 Jun 1880, Clark Co, OH. 25. ii. LUCY A. RICE, b. 22 Apr 1850, Springfield, Clark Co., OH; d. OH. 26. iii. ELIZABETH EMMA RICE, b. 09 Oct 1852, Springfield, Clark Co., OH; d. Abt. 24 Oct 1936, Clark Co, OH. iv. ANDREW WILLIAM RICE35, b. 27 Jun 1855; d. 13 Sep 1857. 27. v. EDWARD HARRISON RICE, b. 31 Jul 1859, Clark Co, OH; d. 04 Mar 1939, Springfield, Clark Co, OH. vi. MYRA ALMA RICE35, b. Nov 1860, Clark Co, OH; d. Abt. 27 Nov 194736. 29. viii. FOREST ANDREW RICE, b. 04 Jun 1863, Springfield, Clark Co, OH; d. 05 Oct 1936, Springfield, Clark Co, OH. 7. ALONZO2 RICE (EDWARD1)37,38,39,40 was born 08 Jul 1825 in Harmony Twp., ClarkCo., OH41, and died 01 Jun 1904 in Springfield, Clark Co., OH41,42. He married MARY ELLEN ALT43,44 16 Jun 1847 in Clark Co., OH45, daughter of ADAM ALT and MARIA DREW. 30. i. ADAM LAFAYETTE3 RICE, b. Abt. 1848, Springfield, Clark Co, OH; d. 26 Sep 1915, Springfield, Clark Co, OH. 31. ii. 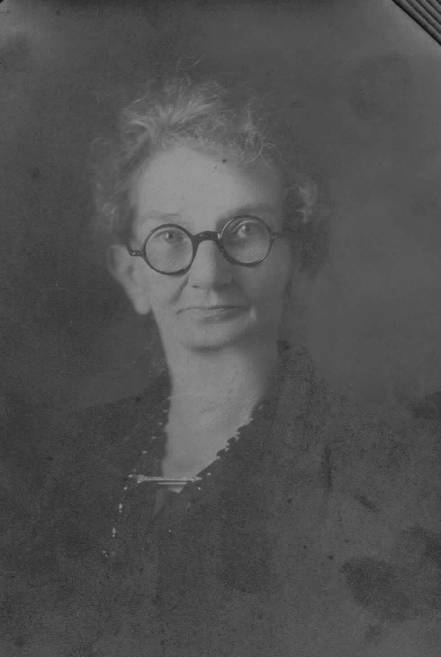 LUCY JANE RICE, b. Sep 1850, Springfield, Clark Co, OH; d. 20 Aug 1936, Springfield, Clark Co, OH. 32. iii. MARIA ELLEN RICE, b. 04 Aug 1852, Springfield, Clark Co., OH; d. 22 Dec 1941, Springfield, Clark Co, OH. *33. iv. MARY BELLE RICE, b. 27 Feb 1856, Springfield, Clark Co., OH; d. 17 Apr 1944, Springfield, Clark Co., OH. v. CHARLES A. RICE46,47, b. Jun 1862, Springfield, Clark Co., OH48; d. 31 Dec 1917, Springfield, Clark Co., OH48,49,50. 8. CELOMA2 RICE (EDWARD1) was born Abt. 1828 in OH, and died Abt. 23 Jul 1912. She married ROBERT B. MEENACH 09 Jan 1848 in Clark Co, OH51,52,53,54, son of WILLIAM MEENACH and SARAH BARR. i. LUCY3 MEENACH, b. 1852; m. UNKNOWN CAMPBELL. ii. EMMA MEENACH, b. Abt. 1855; m. EBENEZER A. HART, JR..
iii. WILLIAM MEENACH, d. 22 Jan 1851, Miami Co, OH. 9. HENRY CLAY2 RICE (EDWARD1)55 was born 25 Sep 1830 in Harmony Twp., Clark Co., OH, and died Aft. 1885. He married SARAH C. DEAN56,57 12 Aug 1856 in Clark Co, OH58,59, daughter of ALEXANDER DEAN and ELIZABETH. 34. i. EDWARD A.3 RICE, b. Apr 1859, Clark Co, OH. 35. ii. HARRY C. RICE, b. Abt. 1867, Clark Co, OH; d. 27 May 1934, Champaign Co, OH. 36. iii. IDA BELLE RICE, b. Abt. 1857. 10. WILLIAM2 RICE (EDWARD1)60,61,62 was born 17 Feb 1834 in Clark Co., OH63, and died Apr 1907 in Clark Co., OH64. He married MATILDA MCBETH GOUDY65 03 Jan 1856 in Springfield, Clark Co., OH65, daughter of ANDREW GOUDY and ELIZABETH MCBETH. i. LEILA LAMORA3 RICE66, b. Abt. 1856; d. 1882. 37. ii. LAURA ORIANA RICE, b. 14 Aug 1857, Clark Co., OH; d. 18 Apr 1886, Clark Co., OH. 38. iii. WILLIAM ELMER RICE, b. 05 Jul 1862, Clark Co, OH; d. 25 Jan 1953, Clark Co, OH. 39. iv. ANDREW HARRISON RICE, b. 08 Apr 1868, Clark Co, OH; d. 1920. 40. v. CLAUDE FLEMING RICE, b. 26 May 1874, Clark Co, OH; d. 16 Jul 1960, Clark Co., OH. 41. vi. ZELLA BESSIE RICE, b. 06 Jun 1877, Clark Co, OH; d. 06 Sep 1952, Clark Co, OH. 11. EDWARD R.3 CHAMBERLIN (POLLY2 RICE, EDWARD1) was born 1839 in OH, and died 1873. He married ELMIRA MINNIE MOSES 07 Dec 1863 in Logan Co, OH67. i. ORRIN A.4 CHAMBERLIN, b. 1864; d. 1872.
ii. CORRIE CHAMBERLIN, b. Abt. 1868. 12. ALONZO3 CHAMBERLIN (POLLY2 RICE, EDWARD1) was born Sep 1843 in OH, and died 21 Apr 1917 in Logan Co, OH. He married AMANDA ACKLY 04 Jul 1866 in Logan Co, OH68. i. HARRY4 CHAMBERLIN, b. Aug 1869; d. Bef. 1900. 13. JAMES S.3 RICE (ASAHEL2, EDWARD1)69 was born Aug 1843 in OH, and died 10 Aug 1922 in Springfield, Clark Co, OH70. He married ANGELINE BUSBEY 18 Mar 1868 in Clark Co, OH71. 42. i. HARRY EDGAR4 RICE, b. 20 Jan 1869, Clark Co, OH; d. 28 Mar 1940, CA. ii. CHARLES L. RICE72, b. 20 Oct 1870, Clark Co, OH73,74; d. 04 Oct 1876, Clark Co, OH75. 43. iii. GLENNA RICE, b. Jun 1875, Clark Co, OH; d. Abt. 18 Sep 1955. 14. LUCY3 SPRAGUE (MELINDA2 RICE, EDWARD1) was born Abt. 1836 in OH. She married ALEX MCMAHAN 11 Oct 1860 in Clark Co, OH76,77. i. HARLEY L.4 MCMAHAN, b. 15 Jun 1862.
ii. HATTIE MCMAHAN, b. 28 Mar 1866.
iii. GLENNA B. MCMAHAN, b. 14 Dec 1871. 15. POLLY ANN3 SPRAGUE (MELINDA2 RICE, EDWARD1) was born Abt. 1838 in OH. She married GILKEY WALLINGSFORD 01 May 1856 in Clark Co, OH78. i. MINNIE4 WALLINGSFORD, b. Abt. 1848. 16. AMANDA MELVINIA3 SPRAGUE (MELINDA2 RICE, EDWARD1)79,80 was born 07 Nov 1843 in Clark Co, OH, and died 11 Feb 1921 in Dayton, OH. She married JAMES E. YEAZELL81 30 Jan 1862 in Clark Co, OH82, son of JACOB YEAZELL and ELNORA FOLEY. 44. i. WILLIAM H.4 YEAZELL, b. 20 Jun 1863, Clark Co, OH; d. 18 Jan 1942, Dayton, OH. ii. HARRY YEAZELL83, b. Abt. 1867.
iii. DONNA B. YEAZELL, b. 19 Dec 1875, Dayton, Montgomery Co., OH. 17. NATHANIEL B.3 SPRAGUE (MELINDA2 RICE, EDWARD1)84 was born Abt. 1846 in Harmony, Clark Co., OH. He married (1) ELLA J. UNKNOWN. He married (2) ISABELL GOODFELLOW 24 Dec 1868 in Clark Co, OH85. i. IDA MAY4 SPRAGUE, b. Oct 1869; m. JOHN H. GARRERD, 04 Sep 1894, Clark Co, OH86. ii. FRANK M. SPRAGUE, b. Abt. 1875. 18. FLORETTA S.3 SPRAGUE (MELINDA2 RICE, EDWARD1)87 was born 1854 in OH. She married JAMES YEAZELL88 03 Apr 1872 in Clark Co., OH89, son of WILLIAM YEAZELL and LYDIA BENNETT. i. WILLIAM S.4 YEAZELL90, b. 1873.
ii. LUCY YEAZELL90, b. 1875.
iii. CHARLES H. YEAZELL90, b. Oct 1877, OH; m. MINNIE. 19. ADALINE3 SPRAGUE (MELINDA2 RICE, EDWARD1)91 was born Nov 1848 in Harmony, Clark Co., OH. She married MILTON CHENEY 27 Apr 1871 in Clark Co, OH92, son of JONATHAN CHENEY and MATILDA HARPOLE. i. MOLLY4 CHENEY, m. UNKNOWN HICKS. ii. HARRIET CHENEY, b. Jun 1873.
iii. PEARL CHENEY, b. Jun 1879; m. UNKNOWN SPRAGUE. iv. HOWARD CHENEY, b. Dec 1885; m. ANNA HOSTETTER. v. SCOTT S. CHENEY93, b. 06 Nov 188794. 20. PARTHENA3 SPRAGUE (SARAH2 RICE, EDWARD1) was born 12 Nov 1838 in Clark Co, OH95. She married WILLIAM J. PRICE 16 Feb 1863 in Clark Co, OH96. i. LOUELLA4 PRICE, b. Abt. 1864. 21. LUCINDA3 SPRAGUE (SARAH2 RICE, EDWARD1) was born 12 Dec 1840 in Clark Co, OH, and died 12 Nov 1907 in Ashtabula, OH. She married WILLIAM HENRY BANWELL 14 Nov 1867 in Clark Co., OH, son of HENRY BANWELL and HANNAH UNKNOWN. 45. i. JESSIE HANNAH4 BANWELL, b. 27 Aug 1868; d. 06 Mar 1927.
ii. OLLIE L. BANWELL, b. 09 Mar 1872.
iii. WILLIAM HAYES BANWELL, b. 06 Nov 1876. 22. JAMES E.3 SPRAGUE (SARAH2 RICE, EDWARD1) was born 15 Mar 1844 in Harmony, Clark Co., OH97,98, and died 31 Dec 193399. He married ELIZABETH BURK 09 May 1878. 46. i. MABEL C.4 SPRAGUE, b. 28 Jun 1879, Clark Co, OH. ii. MYRTLE L. SPRAGUE100, b. Mar 1881.
iii. JAMES E. SPRAGUE101, b. 28 Dec 1882102; d. 07 Jan 1952.
iv. WILLIAM D. SPRAGUE103, b. 25 Mar 1884, Clark Co, OH. 23. DARIUS A.3 SPRAGUE, JR. (SARAH2 RICE, EDWARD1) was born Abt. 1848 in Clark Co, OH. He married PHOEBE H. THORPE 31 Jan 1871 in Clark Co, OH104, daughter of ROBERT THORPE and MARY UNKNOWN. i. ZELLA4 SPRAGUE, b. Abt. Oct 1879.
ii. 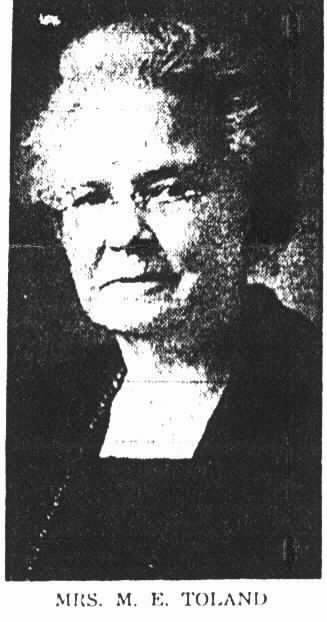 EVA B. SPRAGUE, b. Abt. 1875.
iii. NELLIE SPRAGUE, b. Abt. 1878. 24. WILLIAM S.3 SPRAGUE (SARAH2 RICE, EDWARD1) was born Abt. 1853. He married ISOLINA GARLOUGH 31 Mar 1879 in Clark Co, OH. i. DAISY4 SPRAGUE, b. Nov 1879. 25. LUCY A.3 RICE (HARRISON2, EDWARD1)105 was born 22 Apr 1850 in Springfield, Clark Co., OH, and died in OH. She married G. ALEXANDER MCISAAC 05 Jun 1884 in Clark Co, OH106, son of EDWARD MCISAAC. i. HARRISON ALEXANDER4 MCISAAC, b. 08 Jul 1891; m. PRISCILLA MAY BARTLETT, 29 Apr 1915, Springfield, Clark Co., OH. 26. ELIZABETH EMMA3 RICE (HARRISON2, EDWARD1)107 was born 09 Oct 1852 in Springfield, Clark Co., OH, and died Abt. 24 Oct 1936 in Clark Co, OH108. She married MATTHEW SAMUEL STEWART 23 Feb 1875 in Clark Co, OH. i. ORISSA LEONA4 STEWART, b. 08 Oct 1877, Clark Co, OH; d. Abt. 27 Mar 1956, Clark Co, OH109; m. JAMES EDWIN WARD, 14 Jan 1897, Clark Co, OH110. ii. ROBERT HARRISON STEWART, b. 20 Feb 1879; d. 09 Aug 1879.
iii. WALTER GARFIELD STEWART, b. 27 Jul 1880; d. 11 Mar 1901. 47. iv. SHIRLEY ALETHEA STEWART, b. 28 Apr 1883; d. Nov 1915. 48. v. GLENNA AMELIA STEWART, b. 12 May 1888. 27. EDWARD HARRISON3 RICE (HARRISON2, EDWARD1)111 was born 31 Jul 1859 in Clark Co, OH112, and died 04 Mar 1939 in Springfield, Clark Co, OH113. He married CORA MAY KLINE 08 Jul 1886. 49. i. GENEVA AMELIA4 RICE, b. 02 Mar 1887, Clark Co, OH. 31. LUCY JANE3 RICE (ALONZO2, EDWARD1)139 was born Sep 1850 in Springfield, Clark Co, OH, and died 20 Aug 1936 in Springfield, Clark Co, OH140. She married CALEB A. BYRD141 10 Nov 1870 in Clark Co., OH141. i. BLANCHE BELL4 BYRD, b. 28 Aug 1871; d. Bef. Aug 1936. 53. ii. GRACE EDNA BYRD, b. 12 Dec 1873, Clark Co, OH; d. 11 Dec 1936, Springfield, Clark Co., OH. iii. MAYME BYRD, b. Feb 1876, Springfield, Clark Co, Ohio; d. 14 Jan 1957, Clark Co, OH142; m. I. S. DOUGLASS. 32. MARIA ELLEN3 RICE (ALONZO2, EDWARD1)143 was born 04 Aug 1852 in Springfield, Clark Co., OH143,144, and died 22 Dec 1941 in Springfield, Clark Co, OH. She married CHARLES M. TOLAND145 25 Sep 1872 in Clark Co., OH146, son of JOHN TOLAND and MARY BEST. 54. i. CLARENCE W.4 TOLAND, b. 02 Aug 1873, Clark Co, OH; d. 21 Dec 1954, Springfield, Clark Co, OH. ii. CORA E. TOLAND147, b. 27 Aug 1886, Wapakoneta, Auglaize Co, OH; d. 25 Dec 1958, Springfield, Clark Co, OH; Adopted child; m. WILLIAM H. DRUMM. 55. iii. CHARLES GRANT TOLAND, b. 20 Jan 1894, Clark Co, OH; d. 03 Jun 1967, Sacramento, CA. *33. MARY BELLE3 RICE (ALONZO2, EDWARD1)148,149,150 was born 27 Feb 1856 in Springfield, Clark Co., OH151,152,153, and died 17 Apr 1944 in Springfield, Clark Co., OH154,155,156. She married WESLEY MCDONALD157 20 Dec 1877 in Clark Co, OH158, son of ROBERT MCDONALD. 56. i. ARTHUR L.4 MCDONALD, b. 07 Jan 1882, Springfield, Clark Co, OH; d. 03 Jan 1932, Indianapolis, IN. ii. FRED W. MCDONALD159, b. 14 Sep 1884, Springfield, Clark Co., OH160,161; d. 20 Dec 1940, Springfield, Clark Co., OH162,163,164; m. ETHEL A. BELL165,166, Aft. 1920. *57. iii. FLORA BELLE (FLO) MCDONALD, b. 20 Mar 1889, Springfield, OH; d. 10 Dec 1975, Pensacola, FL. 34. EDWARD A.3 RICE (HENRY CLAY2, EDWARD1)167 was born Apr 1859 in Clark Co, OH168. He married ALICE POOLE 17 Nov 1880 in Clark Co, OH169, daughter of LEMON POOLE and LUCY NASON. 58. i. WILLIAM C.4 RICE, b. Aug 1881, OH. ii. CLAUDE RICE, b. 14 Aug 1887, Springfield, Clark Co, OH; d. 05 Aug 1970, Urbana, Champaign Co, OH. iii. ETHEL V. RICE, b. Dec 1893.
iv. GLENNA RICE, b. 16 Jan 1891, OH; d. 18 Jun 1892, Zane Twp, Logan Co, OH. 35. HARRY C.3 RICE (HENRY CLAY2, EDWARD1)170 was born Abt. 1867 in Clark Co, OH171, and died 27 May 1934 in Champaign Co, OH. He married ELIZABETH LOUISE BRADFORD 06 Jun 1889 in Clark Co, OH172, daughter of UNKNOWN BRADFORD and SUSAN UNKNOWN. i. MAE4 RICE, b. Abt. 1889; m. UNKNOWN FORMAN. ii. EARL R. RICE, b. Abt. 1892, OH; d. 14 Dec 1963, Urbana, Champaign Co, OH. iii. LEO R. RICE, b. Abt. 1898, OH; d. 17 Aug 1961, Champaign Co, OH. 36. IDA BELLE3 RICE (HENRY CLAY2, EDWARD1)173 was born Abt. 1857. She married WILLIS LITTLE 27 Nov 1879 in Clark Co, OH174. i. CLAY4 LITTLE, b. Abt. 1890.
ii. RUTH LITTLE, b. Abt. 1891.
iii. ELVIE LITTLE, b. Abt. 1894. 37. LAURA ORIANA3 RICE (WILLIAM2, EDWARD1)175 was born 14 Aug 1857 in Clark Co., OH, and died 18 Apr 1886 in Clark Co., OH. She married ALBERT K. CROSSLAND175 28 Mar 1880 in Clark Co., OH176, son of JACOB CROSSLAND and EMILY OTSTOT. i. CHARLES E.4 CROSSLAND, b. 14 May 1881, Clark Co., OH; d. 22 May 1886, Clark Co., OH. ii. WALTER EARL CROSSLAND, b. 04 Sep 1883, Clark Co., OH177; d. 26 Jul 1983, Springfield Twp. Clark Co., OH178; m. BESSIE E. ESTLE. 38. WILLIAM ELMER3 RICE (WILLIAM2, EDWARD1)179 was born 05 Jul 1862 in Clark Co, OH180, and died 25 Jan 1953 in Clark Co, OH. He married (1) CLARA YEAZELL181,182,183 03 Jan 1884 in Clark Co, OH184, daughter of ISAAC YEAZELL and ELIZABETH WOLFE. He married (2) RILLA MAE UNKNOWN185 Aft. 09 Sep 1925 in Clark Co., OH. i. ESTELLA B.4 RICE186, b. Apr 1885186.
ii. FREDERICK RAY RICE187, b. Jul 1892187,188; d. Abt. 27 Jan 1990189.
iii. IRENE BEATRICE RICE190, b. 03 Oct 1896191.
iv. RALPH WILLIAM RICE192, b. 07 Oct 1898193,194,195.
v. DOROTHY ESTHER RICE196, b. 18 Jan 1900197; m. FRANK MEIGHEN198, Aft. Jan 1920.
vi. ELDEN FOSTER RICE199, b. 24 Sep 1906200; d. Bef. 1920. 39. ANDREW HARRISON3 RICE (WILLIAM2, EDWARD1)201 was born 08 Apr 1868 in Clark Co, OH, and died 1920. He married MARTHA ANN SCHOCKNESSY202 04 Jan 1892203. 59. i. FLOYD ARNOLD4 RICE, b. 24 Jan 1893, OH. ii. JESSIE BELL RICE204, b. 13 Apr 1896, Clark Co, OH205. iii. HOWARD LEROY RICE206, b. 12 Jun 1894, Clark Co, OH207; d. 03 Jul 1976, Madison Co, OH208. iv. MYRTLE L. RICE209, b. 09 Apr 1903, Clark Co, OH210; d. 14 Aug 1982. 40. CLAUDE FLEMING3 RICE (WILLIAM2, EDWARD1)211,212 was born 26 May 1874 in Clark Co, OH213,214,215, and died 16 Jul 1960 in Clark Co., OH216,217. He married AUTICE MINERVA SKILLINGS218,219,220,221 05 Nov 1896222,223, daughter of LEWIS SKILLINGS and MARTHA HAMMOND. i. FREMONT CHARLES4 RICE224,225, b. 04 Feb 1905226; d. 11 Nov 1977227,228. 41. ZELLA BESSIE3 RICE (WILLIAM2, EDWARD1)229,230 was born 06 Jun 1877 in Clark Co, OH231, and died 06 Sep 1952 in Clark Co, OH232. She married SAMUEL JEFFERSON KISSELL233,234,235 31 Dec 1902 in Clark Co, OH236, son of SILAS KISSELL and ADALINE MCCLURE. i. RUTH LAMORA4 KISSELL237,238,239, b. Abt. 1905; m. UNKNOWN WEAVER239. ii. ESTHER LORENA KISSELL240,241,242, b. 27 Dec 1906, Springfield, Clark County, OH; d. 21 Apr 1954, Cuyahoga Falls, Summit Co., OH; m. FREDERICK WILLIAM KARRES, 20 Jun 1936. 60. iii. ROBERT G. KISSELL, b. 23 Aug 1912, Springfield, Clark Co., OH; d. 29 Dec 1985, Springfield, Clark Co., OH. iv. LEAH KISSELL242,243, m. EARL A. SIMENDINGER244. 42. HARRY EDGAR4 RICE (JAMES S.3, ASAHEL2, EDWARD1)245 was born 20 Jan 1869 in Clark Co, OH246, and died 28 Mar 1940 in CA. He married MAY L. KING Abt. 1895 in Clark Co, OH. i. ROBERT KING5 RICE, b. Aug 1896; d. Abt. 29 Mar 1966.
ii. HARRY EDGAR RICE, JR., b. 01 Oct 1898, Clark Co, OH; d. 25 Jul 1971, Urbana, Champaign Co, OH247,248. iii. DAVID BUSBEY RICE, b. 30 Jun 1902, Springfield, Clark Co., OH; d. 14 Nov 1982, Los Angeles Co., CA. 43. GLENNA4 RICE (JAMES S.3, ASAHEL2, EDWARD1)249,250 was born Jun 1875 in Clark Co, OH, and died Abt. 18 Sep 1955. She married UNKNOWN HENRY. i. MARTHA A.5 HENRY, b. Abt. 1911.
ii. LOUISE HENRY, b. Abt. Jun 1918. 44. WILLIAM H.4 YEAZELL (AMANDA MELVINIA3 SPRAGUE, MELINDA2 RICE, EDWARD1)251 was born 20 Jun 1863 in Clark Co, OH, and died 18 Jan 1942 in Dayton, OH. He married (1) MARGARITE FLORENCE CHANEY 27 Jun 1885 in Clark co, OH, daughter of BENJAMIN CHANEY and MARGARET PIKE. He married (2) DOROTHY APPENZELLER 10 Nov 1906 in Clark Co, OH, daughter of DAVID APPENZELLER and ELIZABETH PREEDIENBACH. i. HELEN AMANDA5 YEAZELL, b. 25 Feb 1892, Columbus, Franklin Co, OH; d. 20 Dec 1979, Dayton, OH; m. (1) HARWOOD SCHAFFER; m. (2) HARRY BENHAM ROHRER, 25 Nov 1914, Montgomery Co, OH. 45. JESSIE HANNAH4 BANWELL (LUCINDA3 SPRAGUE, SARAH2 RICE, EDWARD1) was born 27 Aug 1868, and died 06 Mar 1927. She married EDGAR LELAND MEANS. i. GEORGE FLETCHER5 MEANS, b. 1905, Portland, ME; d. 1971; m. LAURA FOSTER SOULE, 1931. 46. MABEL C.4 SPRAGUE (JAMES E.3, SARAH2 RICE, EDWARD1)252 was born 28 Jun 1879 in Clark Co, OH. She married CHARLES RODDY 25 Nov 1897 in Clark Co, OH253. i. WILLIAM J.5 RODDY, b. 23 Feb 1898.
ii. MARY WINNETTA RODDY, b. 31 May 1900.
iii. MABEL M. RODDY, b. 16 May 1902.
iv. PAUL RODDY, b. Abt. 1899.
v. DOROTHY RODDY, b. Abt. 1905.
vi. FOREST RODDY, b. Abt. 1912. 47. SHIRLEY ALETHEA4 STEWART (ELIZABETH EMMA3 RICE, HARRISON2, EDWARD1) was born 28 Apr 1883, and died Nov 1915. She married EARL SNEAD 05 Feb 1903.
i. THELMA DOROTHY5 SNEAD, b. Abt. 1906.
ii. RUBY IRENE SNEAD, b. Abt. 1910. 48. GLENNA AMELIA4 STEWART (ELIZABETH EMMA3 RICE, HARRISON2, EDWARD1) was born 12 May 1888. She married JOHN A. LAUGHBAUM 28 Jul 1914.
i. HARRY KENNETH5 LAUGHBAUM, b. 18 Feb 1917. 49. GENEVA AMELIA4 RICE (EDWARD HARRISON3, HARRISON2, EDWARD1)254 was born 02 Mar 1887 in Clark Co, OH. She married WESLEY POLAND 11 Oct 1907.
i. WESLEY EDWARD5 POLAND, b. Abt. 1908, Clark Co, OH; d. Abt. 16 May 1979.
ii. HELEN LOUISE POLAND, b. Abt. 1912.
iii. GENEVA ALMA POLAND, b. Abt. 1915.
iv. ROBERT ERNEST POLAND, b. Abt. 1917. 50. PEARL O.4 RICE (HORACE ALONZO3, HARRISON2, EDWARD1)255 was born 20 Jul 1885 in Springfield, Clark Co, OH255, and died 27 Apr 1958 in Springfield, Clark Co, OH255. He married CASSIE E. LAMARR255, daughter of UNKNOWN LAMARR and ELLA UNKNOWN. i. HORACE LAMARR5 RICE255, b. 22 Apr 1912, Springfield, Clark Co, OH; d. Abt. 09 Jun 1987, Jackson, MO256. 51. WALTER ELWOOD4 RICE (HORACE ALONZO3, HARRISON2, EDWARD1)257,258,259 was born 07 May 1887 in Springfield, Clark Co, Ohio, and died 11 Aug 1958 in Springfield, Clark Co, Ohio260,261,262. He married (1) BERTHA E. UNKNOWN263. He married (2) MARIE A. FITZGERALD264 Aft. Apr 1922.
i. WALTER GERALD5 RICE264, b. Abt. Aug 1916.
ii. ROBERT T. RICE264, m. AUDREY. iii. MARY MARGARET RICE264, d. Abt. 24 Mar 1997; m. UNKNOWN WASHBURN. iv. PATRICIA RICE264, m. UNKNOWN HUNT. v. UNKNOWN RICE264, m. RALPH WILSON264. vi. PAUL R.5 RICE264, b. 03 Oct 1926, Springfield, Clark Co., OH; d. 05 Jan 2002, Springfield Twp., Clark Co., OH; m. MARTHA L. ARMENTROUT, Abt. 1951. 52. WILLIAM ALONZO4 RICE (ADAM LAFAYETTE3, ALONZO2, EDWARD1)265 was born 19 Feb 1874 in Springfield, Clark Co, OH266, and died 02 Feb 1935 in Springfield, Clark Co, OH267,268,269. He married DEVELLA K. WILSON270,271. i. EMILY5 RICE272,273, b. 26 Jul 1900, Springfield, Clark Co., OH274,275,276; d. Jan 1984, Washington, C.H., Fayette Co., OH277; m. JOSEPH COBERLY278,279. 53. GRACE EDNA4 BYRD (LUCY JANE3 RICE, ALONZO2, EDWARD1) was born 12 Dec 1873 in Clark Co, OH, and died 11 Dec 1936 in Springfield, Clark Co., OH. She married JOHN WILLIAM KLAPP280 07 Jul 1892 in Clark Co, OH280. i. WILLIAM ALONZO5 KLAPP, b. 01 Dec 1892, Springfield, Clark Co., OH; d. 05 Aug 1953, Springfield, Clark Co., OH. 54. CLARENCE W.4 TOLAND (MARIA ELLEN3 RICE, ALONZO2, EDWARD1)281 was born 02 Aug 1873 in Clark Co, OH, and died 21 Dec 1954 in Springfield, Clark Co, OH. He married (1) MINON IRENE BENTZEL282 11 Nov 1896 in Clark Co, OH283. He married (2) OLIVE MAE CLARK Aft. Mar 1926.
i. GLENNA5 TOLAND, b. Sep 1897, Springfield, Clark Co, OH; d. 09 Feb 1960, Springfield, Clark Co, OH; m. WILBUR C. JACOBS. ii. WILBUR B. TOLAND, b. 09 Mar 1900, Columbus, Franklin Co, OH284; d. 07 Jan 1981, Springfield, Clark Co, Ohio285,286; m. MARTHA N. SHANK. iii. LOUETTA TOLAND, b. 27 Aug 1903, Springfield, Clark Co, OH; d. 15 Jul 1965, Glen Ellen, IL; m. JOHN JOY SCHMINK, 25 Oct 1928, Sprngfield, Clark Co, OH. 55. CHARLES GRANT4 TOLAND (MARIA ELLEN3 RICE, ALONZO2, EDWARD1)287 was born 20 Jan 1894 in Clark Co, OH288, and died 03 Jun 1967 in Sacramento, CA288. He married NELLIE BARBARA SCHENK289,290 Jun 1915291, daughter of JOHN SCHENK and BARBARA KUTZ. i. WILLIAM GRANT5 TOLAND, SR, b. 19 Nov 1923, Springfield, Clark Co., OH; d. 24 Apr 2000, Roseville, CA; m. MARY ALPHA SCHREIBER, Abt. 1940, KY.
56. ARTHUR L.4 MCDONALD (MARY BELLE3 RICE, ALONZO2, EDWARD1) was born 07 Jan 1882 in Springfield, Clark Co, OH, and died 03 Jan 1932 in Indianapolis, IN292. He married MAY F. MCINTIRE 11 Jun 1907 in St. Mary's, OH, daughter of CHARLES MCINTIRE and CLARA BLUE. i. CLARA BELLE5 MCDONALD, b. Jun 1915, OH; d. 15 Sep 1973, Cincinnati, Hamilton Co, OH293; m. STANLEY A. MORSBACH. *57. FLORA BELLE (FLO)4 MCDONALD (MARY BELLE3 RICE, ALONZO2, EDWARD1)294,295 was born 20 Mar 1889 in Springfield, OH296,297,298, and died 10 Dec 1975 in Pensacola, FL299,300,301. She married ARTHUR LESTER FOLEY302 12 Dec 1911 in First Baptist Church, Springfield, Clark Co, OH302,303, son of CHARLES FOLEY and ANNA TOLAND. i. ANNABEL5 FOLEY304,305, b. 21 Oct 1915, Springfield, OH306,307; d. 11 Nov 1915, Springfield, OH308,309,310. * ii. BARBARA LOU FOLEY311, b. 28 Sep 1921, Springfield, Clark, Ohio, USA311; d. 08 Mar 1996, Pensacola, Escambia, Florida, USA312; m. JACK ALLEN MARTIN313,314, 09 Jun 1945, Springfield, Clark, Ohio, USA315,316. 58. WILLIAM C.4 RICE (EDWARD A.3, HENRY CLAY2, EDWARD1) was born Aug 1881 in OH. He married ETHEL F. UNKNOWN. i. MILDRED5 RICE, b. Abt. 1902.
ii. ROBERT RICE, b. Abt. 1910. 59. FLOYD ARNOLD4 RICE (ANDREW HARRISON3, WILLIAM2, EDWARD1)317 was born 24 Jan 1893 in OH317,318. He married NAOMI UNKNOWN. i. STEWART M.5 RICE, b. Abt. Dec 1919, Clark Co, OH; d. 24 May 1920, Clark Co, OH. 60. ROBERT G.4 KISSELL (ZELLA BESSIE3 RICE, WILLIAM2, EDWARD1)319,320 was born 23 Aug 1912 in Springfield, Clark Co., OH, and died 29 Dec 1985 in Springfield, Clark Co., OH. He married ELEANOR BLACK. i. ROBERT G.5 KISSELL, JR..
ii. LINDA KISSELL, m. FRANKLIN G. BROWNE.